The mission of The RVYSEF is to assist in providing sports equipment to the children and youth of needy families in the Greater Lakes Region community, in an effort to ensure that every child has the opportunity to participate in community sports regardless of financial circumstances. Click Here to see how RVYSEF started ! Click Here to Request Youth Sports Equipment! FOR MORE INFORMATION CHECK US OUT ON Face Book. Join us at Leavitt Park from 9am to 2pm. Pleanty of tables set up with sports cards and collectibles. Our Spring Raffle will be drawn at the Card Show. Don't be left out get you raffle ticket for anyone of these great items. 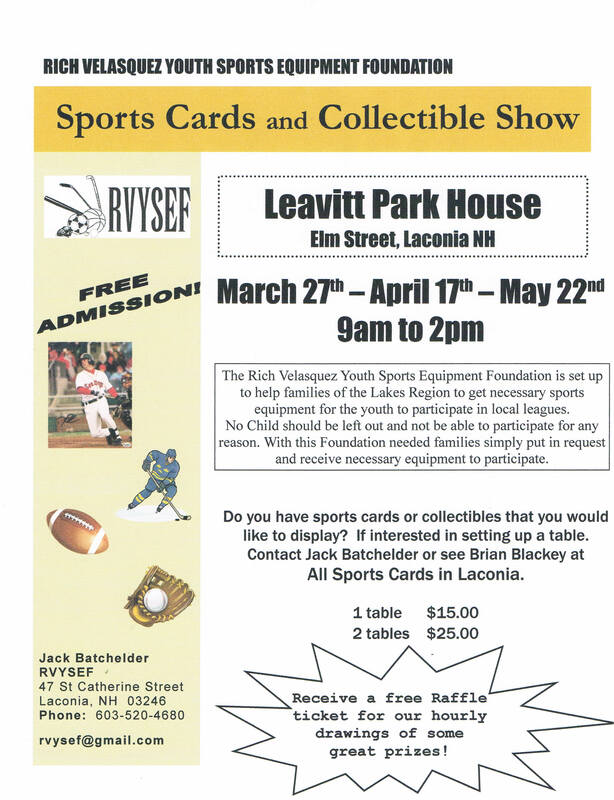 Signed Baseball by Chris Carpenter, Signed Baseball by Daniel Nava, Signd Baseball by Heidi Watney, Dinner and Movie package, Pair of Muskrats Season Tickets, Irwin Motors Oil Change, Local certificates from, Awakenings, Downtown Deli, Village Bakery and Much More! Tickets are $1.00 each or 8 for $5.00. If you are interested in this program and what it is about, please e-mail Jack Batchelder at .